I recently had the privilege to interview one of my all time favorite artists for the Russian Sci-Fi/Fantasy magazine Mir Fantastiki! This is an English transcription of that interview, which was done in English. The rest of the article was translated from Russian. Special thanks to Sergey Serebryanskiy for the intro and formatting! Special thanks to Mir Fantastiki for allowing me to post this here! Gerald Brom (who goes simply by Brom) was born in Albany, Georgia in 1965. As a child, he traveled around the world with his father, who was in the military. 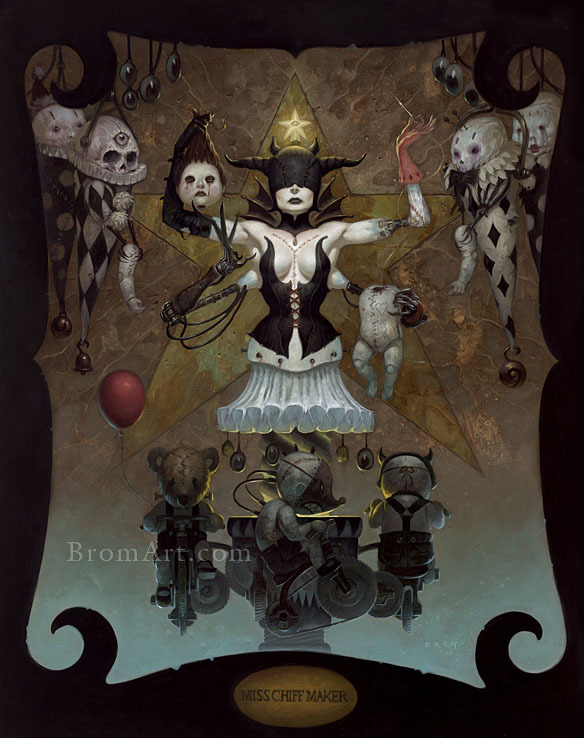 Brom did not attend art school, but drew since childhood, and a the age of twenty he became professional artist. Four years later Brom started working with the company TSR, engaged in projects on role-playing games, and his career has been linked to fiction ever since. Brom worked on collectible card games and comics - including Dark Horse and DC Comics. He created the concept art for movies ("Sleepy Hollow," "Scooby-Doo", "Van Helsing") and gaming (gamers should thank his designs for the Doom and Diablo series). Covers drawn Brom decorate books by Michael Moorcock, Edgar Rice Burroughs, Terry Brooks, Anne McCaffrey, and RA Salvatore. Brom is not only an artist but he's a writer released. Over the years he's released four books featuring his own illustrations, each a dark and exciting phantasmagoria that matches Brom's style. At the recent artist convention "Spectrum: Live" (the report you can in this issue of "World of Fiction", page 82) Brom was awarded the title of Grand Master. As the inscription on his official artist website says, "Brom is currently kept in a dank cellar somewhere in the drizzly Northwest. There he subsists on poison spiders, centipedes, and bad kung-fu flicks. When not eating bugs, he is ever writing, painting, and trying to reach a happy sing-a-long with the many demons dancing about in his head." "I'm drawn to the darker side"
Five years ago, we spoke with Brom about his dark and haunting images but since then the famed artist managed to do a lot. For example, he's written and produced a number of books with his own illustrations and worked on concept art for Diablo 3. Today we talk with Brom about his terrifying tales of monsters and draw upon his own fears. Last year you released the book Krampus: The Yule Lord. Can you tell us a bit about it? Krampus is a Christmas demon that goes back to pagan times. My wife introduced him to me. I had no idea at the time who this guy was but I found out that essentially he likes to take naughty children, put them in a sack, beat them, and throw them in a river, and if they're really naughty he will cook them and eat them, so instantly I fell in love with him. When I started digging into his back story and found that he predates Santa Clause and thought it would be interesting if this guy came crawling back wanting to reclaim his holiday. That was the catalyst that started the book. Why do you decide to make people who would likely be considered the "bad guys" the protagonists of your books? I kind of feel like there are really no good guy and bad guys in the stories. As a writer when you start to define motivations you come to understand the characters and rarely does a character think of themselves as evil. Since a lot of it was from his point of view I think it just came across as what his desires were and who was in the way of his desires. With your family, do you celebrate Christmas, Yule, or both? We celebrate all of them together with a little Halloween mixed in. What does Krampus have in common in regards to other stories of yours, such as The Child Thief, and what are some of the differences? The similarities are some of what I was touching on earlier, the fact that I tend to like to tell stories from the point of view of the monster to some degree, to be empathetic to what their desires are. In the Child Thief, even though it was a retelling of Peter Pan, Peter comes across a very charismatic psychopath but once you get to know him you understand the why's [in regard to] the way he is and you become sympathetic to his plight. As far as differences, I think there are more similarities than differences because I'm drawn to the darker sides of literature and characters and understanding their motivations. You wrote that The Child Thief was born from the "unsettling events of James Barry's book." Are there any other children's books that you can think of where you've found similar unsettling events? You know, there are more to list than not. They're called cautionary tales for a reason, the Grimm's fairly tales and stuff, they were meant to scare kids. [For instance] Ginny Greenteeth the bog fairy, if you go near the bog, she will pull you underwater and eat you. What that was meant to do was scare the kids away from the bogs and the creeks where they would drown. To answer your question there's an endless amount of stories that need to be told and retold. Do you think you'll look to other famous stories to make a book out of in the future? I might but I feel that it's become a bit of a trend in current literature and movies to retell old fairly tales in sort of a hip edgy way. The creative [muse] in me likes to look for something a little more personal to do, so I'm trying a new book project where I'm looking to just invent my own mythology from the ground up. It does not. It's very separate but there might be a painting or two in there that end up rolling into this book. In your books the protagonists generally get in trouble because of drug trafficking. Are you trying to subtly show us that it's a path from which no good can come from? A lot of people read political themes in my books whether it's environmental, drug [related], or political but none of that matters to me. To me it's about story. I want to tell an engaging entertaining story, I want to be honest to the story, and if those elements are honest to the characters that's why they're there. As you come up with the stories and you draw a cover to it, do you feel that having a visual cover featuring the main character(s) in some way limits the imagination of the reader? Growing up I loved literature that was illustrated. Even though I had my own vision I liked seeing someone else's vision. Whether you call it a gimmick or my unique ability to be able to both illustrate and write, create these characters and worlds both from a literary point of view and a from an illustrative point of view, it's a lot of fun because it's the same thing I did as a kid. I'm hoping that that fun crosses over to the reader and the fans. You talk about a lot about supernatural elements in your stories. Have you ever seen anything supernatural you'd be comfortable discussing? I'm pretty much superstitious about everything. I'm scared of everything, I'm scared of all religions. That's why I believe in all of them. We used to live out in Elkhorn, Wisconsin where there was this rumored Beast of Bray Road, this werewolf creature that people had seen. My mind just went nuts. Every time I took the garbage out at night I knew that guy was waiting in the bushes to get me, but as far as any actual personal experiences I've had, my imagination has a tendency to create its own horrors. What do you prefer when experiencing a horror story: suspense, violence, or a mix? I think there's just so many wonderful ways to handle horror. On one hand I love what Del Torro does to create this empathetic understanding of the creatures that we're afraid of but at the same time I love stories where the creature is a mystery and is discovered through the tale. [Stories where the monster is] truly is a horror. I don't have a preference and think there's a multitude of wonderful ways to handle the material. When you worked on the concept art for Diablo 3, were you free in creativity? What limits did Blizzard-Activision put in place and was it any different from working on the previous games? It was a wonderful experience. The life of an illustrator can be painfully solitary at times and I have learned what keeps it interesting is to break it up; meaning sometimes working on my own personal projects where I have complete control but sometimes working in a community where it's a collaborative project. In the case of Diablo was collaborative and after working on two books for the last 8 years, to be able to go in [a studio] and work with other artists over a year was a complete pleasure. It was fun to feed off their creativity and I really enjoyed having the opportunity to bring their incredibly horrible monsters to life. Were you allowed to play the previous games beforehand? Do you play games? I used to play games a lot more when I was younger and i'm a big fan of all the blizzard games. In this case, yes, I was encouraged to play them. It was great to see how they [the monsters] actually interacted on the screen. It helped me when I went to paint them. Did they also give you additional back story? They did. They had tons of concept work so you also could see how the creatures evolved and where they came from. Again that was all part of the excitement. It was very inspiring. It would have to be Diablo. That's the one my wife ended up having to hide from me because it was interfering so much with work. (jokingly) I usually tell them not to eat paint but these days everybody works on the computer so that's not as relevant. What's important is to put what you want to do in your portfolio because the work you'll get will be based on what's in your portfolio. Cover for the book "The Plucker." A depiction of the main character - Jack. Jack and his box are stuck gathering dust underneath the bed with the other forgotten toys but when the angry spirit of the Plucker is set loose, Jack has to rise to the defense of the boy who once abandoned him. "Horned" illustration to the book "The Rose Devil." "-I burned their churches, crucified their priest, raped their women and fed their children to our animals. He said it so casually, as if described merely serving a holiday table."